5.0 Earthquake hits the Northwest Territories, Canada. Bangladesh – The flood situation in Munshiganj has worsened amid continuing rain and rising river levels. The Padma is eroding its bank at an alarming rate. According to the Water Development Board records at 9am Friday, Padma River was flowing at 20cm above the danger mark at the Bhaggyakul Point while new areas in the district were flooded in the last 24 hours. 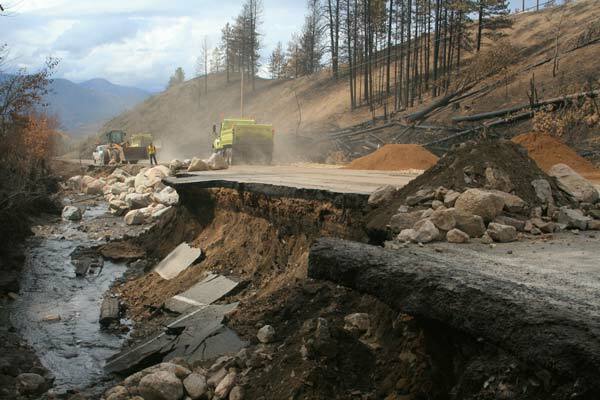 Washington, USA – Following the severe wildfires last month, torrential rains have brought flash floods and mudslides which damaged a number of homes and road infrastructure. 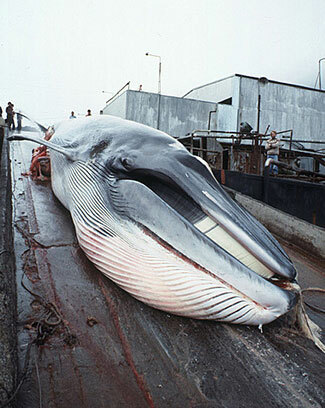 Favorable weather during spring and most of this summer has allowed Norway’s commercial whaling ships to slaughter more of the marine mammals than they have since the country resumed its whale hunt during 1993, in violation of a worldwide moratorium. While Japan kills whales under the guise of research, Norway and Iceland are the only two nations that conduct commercial hunts. At least 729 whales have been harpooned by Norwegian ships so far this summer, up from the 590 rorqual whales slaughtered last year. Greenpeace says Norway’s hunt will eventually end as demand for whale meat continues to wane. The delicacy has already become less popular in Norway as well as in Japan, where storehouses are flooded with surplus meat from the country’s “research” whaling. “The weather this summer has been very good, which favored significant whale meat demand for grilling in northern Norway, but also made hunting easier thanks to clear skies and calm waters,” said Truls Gulowsen, the head of Greenpeace in Norway. The culprit? Climate change. A recent research paper that tracked 47 years of air-temperature records in Tarfala Valley, below the Kebnekaise glacier, found a significant warming trend. 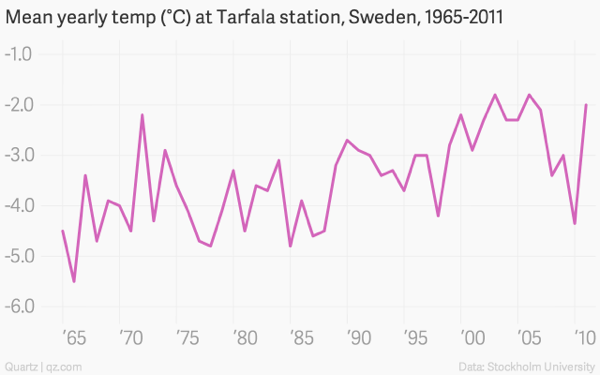 The period from 1995 to 2011 was 1.08°C warmer than the period from 1965 to 1994. Eight of the ten warmest years covered by the study occurred since 1999. Senegal confirms its first case of ebola. 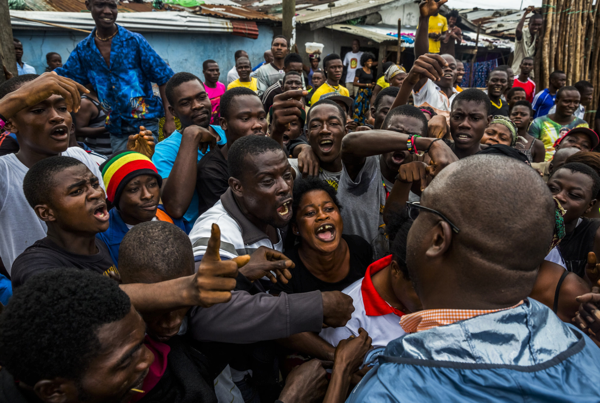 Liberia says it will open up a slum in its capital where thousands of people were barricaded to contain the spread of Ebola. The slum of 50,000 people in Liberia’s capital was sealed off more than a week ago, sparking unrest and leaving many without access to food or safe water. Stromboli (Eolian Islands, Italy): The effusive eruption continues with little changes and no signs of ending soon. The effusion rate is fluctuating, but elevated and the vent feeds two flows that travel down the Sciara in two channels. Bardarbunga (Iceland): The still intense earthquake swarm and deformation continues with little variation. No further eruptive activity has occurred since yesterday’s “blitz” eruption. The intrusion has not changed position and is focused on a 15 km long stretch both under and outside the Dyngjujökull glacier NE of Bardarbunga. Earthquake activity also continues under the volcano’s caldera with the strongest today so far being a magnitude 5.4 event this morning. White Island (New Zealand): A swarm of small earthquakes was detected on Thursday near White Island, New Zealand scientists monitoring the volcano reported. The largest event is magnitude 3.3 and was located within 5km of the island. All of the earthquakes appear to be within 5 km of White Island. The size of the locatable events ranges from magnitude 2.5 to 3.3 and all are shallow (less than 10 km depth). 5.8 Earthquake hits southern Greece. 5.8 Earthquake hits Kyushu, Japan. Tropical storm Marie is located about 920 mi…1480 km WSW of San Diego, California. Marie is still generating huge swells that will pound the coast of Southern California and Mexico’s Baja Peninsula through Friday. Hurricane Cristobal strengthens a little while it races toward the North Atlantic located about 435 mi…700 km SSE of Halifax, Nova Scotia. Hurricane Cristobal continues to churn northeastwards over the Atlantic towards Iceland. Cristobal will merge with a frontal zone on Friday and transition to a powerful extratropical storm that will likely bring tropical storm-force winds and heavy rain to Iceland on Sunday night. Philippines – Heavy rain fell over parts of Central Visayas, including Cebu and Bohol provinces on Thursday, causing floods that stranded commuters and slowed traffic. Bangladesh – Severe flooding in northern Bangladesh has paralyzed 12 districts, leaving hundreds of thousands of people stranded. Monsoon floods that have hit the region for the past month have deteriorated over the past 10 days. At least 75,000 people have been directly affected in the town of Bogra alone and at least 50 educational institutions have been shut down due to the flood. Three students have contracted dengue fever in Japan, marking the first domestic outbreak of the disease in some 70 years. The week’s hottest temperature was 118.9 degrees Fahrenheit (48.3 degrees Celsius) at Qaysumah, Saudi Arabia. The week’s coldest temperature was minus 77.1 degrees Fahrenheit (minus 60.6 degrees Celsius) at Russia’s Vostok Antarctic research station. Initial signs from the monarch butterfly’s first stop on the fall migration southward to Mexico indicate the insect’s population could be about to rebound after a devastating two years. The CBC reports that staff at Ontario’s Point Pelee National Park say they have found more caterpillars this year, as well as male monarchs defending patches of milkweed. 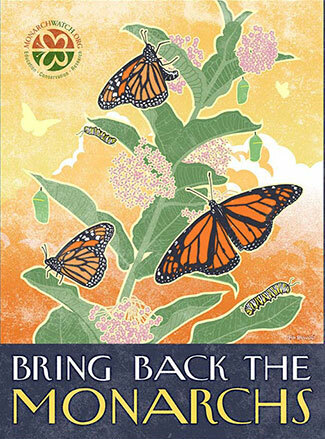 Monarchs need that once-ubiquitous plant to breed and feed. “We’re definitely seeing more monarchs fluttering around the park this year than we did at the same time last year, so that’s encouraging for all of us,” said park interpreter Sarah Rupert. Chip Taylor, director of Monarch Watch, says that after an all-time low population last year, the number of monarchs could rise by 30 to 40 percent this fall. Last summer’s extreme drought in the U.S. Corn Belt wiped out huge numbers of milkweeds. Monarch experts say that was a fatal blow to many of the iconic fliers. Bárdarbunga (Iceland): An eruption started in Holuhraun north of Dyngjujökull at around 00:02. Seismic tremor was observed on all seismic stations and the web camera installed in the area by Mila has showed some nice pictures of the eruption. It is a small fissure eruption and at 02:40 AM the activity appears to have decreased. An exclusion zone 1.5 km above and 15 km around the eruption site is in place. The circumstances around the eruption are somewhat enigmatic. It is interesting to note that the large intrusion, estimated to contain approx. 350 million cu meters of magma on a length of 40 km only produced a tiny fissure eruption (so far, at least). Tavurvur volcano (Rabaul, Papua New Guinea): A large explosive eruption began at Tavurvur volcano (Rabaul caldera) this morning. The eruption seems to be similar to a paroxysm on Etna. Lava fountains and significant ash emissions were observed. The ash plume reached a height of approx. 60,000 ft (18 km) altitude. Aviation colour code was raised to red. 5.3 Earthquake hits Kapulauan Barat Daya, Indonesia. Tropical Storm Marie located about 820 mi…1320 km WSW of Punta eugenia Mexico with maximum sustained winds…50 mph…85 km/h. Present movement…NW or 305 degrees at 16 mph…26 km/h. Hazards affecting land: surf…swells generated by Marie are expected to gradually subside in the extreme southern Gulf of California today…and the West Coast of the Baja California peninsula and Southern California through Friday. Life-threatening surf and rip current conditions are likely as a result of these swells…as well as minor coastal flooding. Hurricane Cristobal located about 305 mi…490 km NNW of Bermuda and about 600 mi…965 km SSW of Halifax Nova Scotia with maximum sustained winds…75 mph…120 km/h. Present movement…NE or 50 degrees at 26 mph…43 km/h. Hazards affecting land: surf…swells generated by Cristobal are affecting Bermuda and the U.S. East Coast from North Carolina northward through New England. These swells are likely to cause life-threatening surf and rip current conditions. China – A landslide in Guizhou province has claimed the lives of at least seven people and left 20 others missing. The landslide destroyed more than 70 houses in the village of Yingping. Wildfires are taking off in Canada as the country goes through one of its hottest and driest summers in decades. Wildfire activity in the Northwest Territories is more than six times higher than its 25-year average, and as of last Tuesday a total of 162 wildfires were burning in British Columbia. The latter province has seen 1269 wildfires so far this year, along with 314,895ha of land burned – almost equivalent to 2010, when the province lost 337,149ha to various blazes. The fires have cut through the boreal forests that lie just outside the Arctic Circle throughout Canada, aided by the hottest and driest summer the Northwest Territories have seen in 50 years. The fires can kick smoke up to 10km or even 15km into the atmosphere, leaving massive plumes that can be spotted by satellite and seen as far away as Portugal.